20th Century Fox has released a teaser trailer for Bohemian Rhapsody, the Queen movie starring Rami Malek (Mr. Robot, Short Term 12) as frontman Freddie Mercury. The movie follows the ups and downs of the band on their path to one of the greatest concert performances of all time. 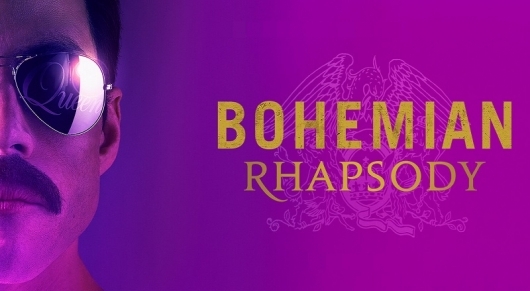 You can read an official synopsis for Bohemian Rhapsody and see the first trailer and a poster below. Starring alongside Malek in the movie is Lucy Boynton (Murder on the Orient Express, Sing Street), Gwilym Lee (Midsomer Murders, Jamestown), Ben Hardy (X-Men: Apocalypse, Only the Brave), Joseph Mazzello (Jurassic Park, The Social Network), Aiden Gillen (Game of Thrones, Maze Runner), Tom Hollander (Pirates of the Caribbean, In the Loop), and Mike Myers (Wayne’s World, Austin Powers). It’s written by Anthony McCarten (The Theory of Everything, Darkest Hour) and Peter Morgan (Frost/Nixon, Rush), and directed by Dexter Fletcher (Eddie the Eagle, Wild Bill), who stepped in to replace previous director Bryan Singer after he was fired from the project. Bohemian Rhapsody will be released in theaters on November 2nd. Visit http://www.PutMeInBohemian.com for a chance to have your voice included in the film.